OS X Tips and Tricks is the second part of our some of the hidden features, less known features of UNIX origin. Some funny, some useful. You can read the previous article named OS X Tips and Tricks – Features You Might Not Know to enjoy some more tricks. 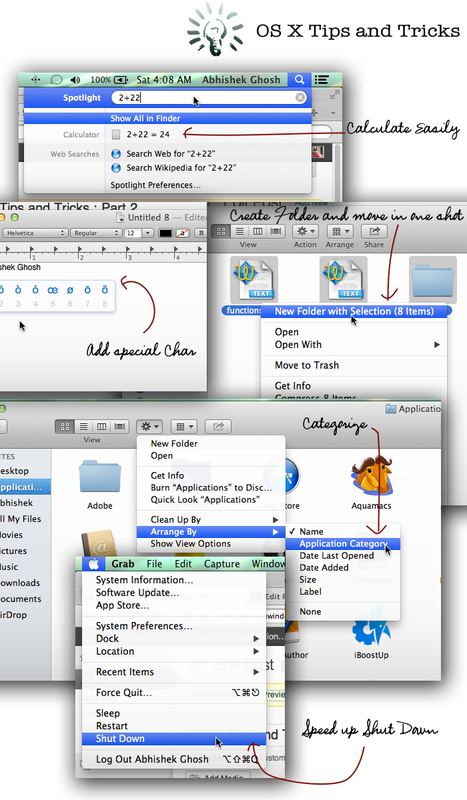 Here are more 8 tips to go faster with Mac. As like we said in our previous article on TextEdit tips and tricks, it is obvious that, it is not possible to discover all these tricks and tips by one person. Unless mentioned, author has no claim over these tips and tricks, these runs within user circles, some website published; some are not published. Although this guide, OS X Tips and Tricks is intended for the basic users, advanced users might find some forgotten or less known features. No need to run the OS X calculator App for fast calculation. Spotlight is quite capable of. Type any current operation using the +, -, / and * and you will get the results instantly. Like just type 2+2 and you will get 2+2=4. Needless to say, Pressing [Command] + [Space Bar] activates the Spotlight. If you for example kept a text as Word document and it is saved in a folder, you can access it easily and quickly without using the click in the Finder. Simply right-click on the document title to display the directory containing it. If you have hundreds of photos, and need to put in the same folder, for example; you will not need to create a folder separately, drag the desired pictures to be included. Simply select your items, then right click and choose New Folder with Selection. As you install software, the application folder will be messy. It is possible to classify the applications by category. Open a Finder window before accessing the Application directory. You just have to click on the cogwheel icon and Arrange by Applications Category. Before turning off your computer using the ? menu, know that you can avoid the dialog box and countdown a minute. As usually click on the ? menu and hold down the Alt / Option key. These options loss their dots visually and a single click will allow you to turn on your machine faster. You certainly do not use every day accented characters which are a bit little exotic and therefore do not know the keyboard shortcut to display. An option appeared in Lion onwards that allows you to display all possible letter in the manner of iOS accents. Hold A or O button and you will not have to choose the right accent (only for OS X App like TextEdit). Use numeric key to enter the character. Also read Mac TextEdit Tips and Tricks for more tips. This tip is probably familiar to most regular Mac users. However, many users do not know. If you want to reply to an email quoting a part of the message you are replying, you can just highlight it before you press the reply button in Mail. Before leaving your computer you can lock the screen. To do this, press simultaneously [control]+ [Shift] + [Eject]. The screen locks automatically and the password of the session will be necessary to resume the job. (This is variable feature depending upon the keyboard). This Article Has Been Shared 6263 Times! Tips To Keep Mac and MacBook Pro Faster required some elementary knowledge of UNIX and few command line works. Mac is a professional instrument and needs care. Cite this article as: Abhishek Ghosh, "OS X Tips and Tricks : Part 2," in The Customize Windows, August 16, 2013, April 21, 2019, https://thecustomizewindows.com/2013/08/os-x-tips-and-tricks-part-2/.